Philadelphia is one of America's most important historical cities. That history is specifically preserved and presented in an area of the city called “Historic Philadelphia,” where museums and architecture celebrate and document the past. Although the works of art included in “A Sense of Place” at the Arthur Ross Gallery are modern Japanese prints, many of the questions and themes explored in the exhibition are easily transferable to other famous places, including Philadelphia. What makes a place famous? How do people promote a site as a famous place? On April 18th 2015, the class went on a walking tour of Philadelphia during which each student presented his or her site. The text of those presentations appears below. You will also find images from our adventures around Philadelphia. Standing at the corner of Ninth and Walnut Streets in Philadelphia for 200 years, the Walnut Street Theater, a national historical landmark, has housed two centuries' worth of American popular entertainment. The Walnut remained a significant player on the American theater scene throughout the twentieth century, and it was home to many pre-Broadway tryouts of plays that would go on to become American classics. Several famous American actors have performed here at the Walnut, including the Marx Brothers, Helen Hayes, Jessica Tandy, Edwin Forrest, Lauren Bacall, and many more. Originally, when the theater opened its doors on February 2, 1809, it served as an equestrian circus. But the theater’s career as an equestrian circus did not last long. By 1812 the building had been converted to a legitimate theater—and the circus ring was replaced by a stage. President Thomas Jefferson and the Marquis de Lafayette were in attendance on the opening night of The Rivals, the Walnut’s first theatrical production in 1828. In 1837, an 80-foot dome was added to the theater, making it the tallest structure in Philadelphia at that time. A place of many “firsts,” the Walnut was the very first theater to install gas footlights and air conditioning in 1855. (Notably, the first copyright law protecting an American play had its roots at the Walnut!) During the 1880s, the Walnut underwent many renovations, including a new stage for more elaborate musical comedies. In 1920, the interior was again rebuilt within the old exterior using structural steel in a design by William H. Lee. The Walnut Street Theater’s rich history is evident backstage as well, as it is one of only a few remaining hemp housing in the country. To this day, it continues to operate with the original grid, rope, and sandbag system that was in use nearly two centuries ago. In 1964, the Walnut Street Theater was designated as a National Historical Landmark. Five years later, it was renovated to become a performing arts center to include variety of live entertainment, such as A Man For All Seasons. If you were ever enrolled in an American elementary school, you probably know something about Philadelphia’s Independence Hall, the original home of the Liberty Bell and the place where the Declaration of Independence and the U.S. Constitution were signed. The most ambitious public project of its time, this Georgian style building was designed by Andrew Hamilton and constructed between 1732 and 1753. Over the years the building has undergone many restorations including steeple additions and removals and complete overhauls of its interior design. The only remaining, original part of the building is the exterior of the central portion. Despite these numerous changes, today the building appears as it did in 1776, preserving the building’s first history as the place where the nation’s founding father’s met, debated, and declared independence. This restoration of the site is important for several reasons. In her book Independence Hall in American Memory (2002), Charlene Mires persuasively argues that the emphasis placed on the building’s original identity (from textbooks to tourist pamphlets), obscures the more dynamic, evolving history of the building as a state capital, cultural center, courthouse, political arena, and site of civil disobedience. These other histories, in Mires’ view, have largely been neglected in favor of an idealized vision of America’s founding. On a recent show, Bill Maher discussed a related debate concerning how American history is taught. Some schools districts in this country have recently argued that the best model is to not include too many negative views of American’s past. Bill Maher responded to this revisionist curriculum by pointing to the fact that most of the progressive and positive events in our nation’s history occurred in reaction to grievous errors, i.e. abolition in response to slavery, women’s suffrage in response to legal discrimination, child labor laws in response to indentured servitude. In other words, acknowledgement of the best requires knowledge of the worst. Similarly, the focus on Independence Hall as the “birthplace of America” conceals much of its history as well as the history of the nation it represents. For example, choosing not to remember the building as the site of Frederick Douglass’s 1844 speech on liberty turns a blind-eye to America’s history of slavery as well as it’s abolition of slavery. As Charlene Mires’ research has shown, Independence Hall has many such “forgotten histories.” For example, in 1912 the city government of Philadelphia ruled that Independence Square could only be utilized for officially sanctioned, “patriotic” events. To quote from the film Dr. Strangelove (1964), this city law was effectively like saying: “You can't fight in here! This is the War Room.” Free speech was not restored to the home of “independence” until 1947 when this law was ruled unconstitutional. Have you ever thought of a place that connects art and science?This is American Philosophical Society (APS) situated in the Old City of Philadelphia that our curatorial team visited during a cold afternoon in March. Being the oldest learned society in the United States, APS was founded in 1743 by Benjamin Franklin and his friends to expand and promote knowledge. For two decades the APS’s members were meeting in various locations until they received a place at 104 South Fifth Street. The Federal style design of Philosophical Hall belongs to Samuel Vaughan, an English merchant and political activist. Later the architecture of the Hall inspired artist Frank H. Taylor to include it in the series "Old Philadelphia" prints, (1915-27). The membership of APS reveals its high status: George Washington, Thomas Jefferson, Benjamin Rush, Thomas Paine, David Rittenhouse, Charles Darwin. The Society was always progressive for the time. In 1789, it elected the first woman, Russian Princess Yekaterina Romanova Vorontsova-Dashkova. In the 21st century, the American Philosophical Society continues to sustain the initial mission. It honors renowned scientists and scholars, supports research, and provides accesses to the collections. The American Philosophical Society Museum, that currently occupies Philosophical Hall, preserves a rich collection of rare books, manuscripts, works of art as well as it yearly hosts thematic exhibitions and contemporary art projects to connect art and science in Philadelphia. In 1719, Philadelphia’s Christ Church purchased the nearby burial ground, a plot of land that would become Benjamin Franklin's final resting place. Although interments were made not long after the ground was laid out, the oldest inscription on grave stones dates from 1721. At the northwest corner of the ground lies the grave of Benjamin Franklin, his wife Deborah, and their son Francis F., their daughter Sarah Bache, and also the graves of John Read, Mrs. Franklin’s father; and Richard Bache, Franklin’s son-in-law. The plain stone that covers their resting-place reflects his character better than any epitaph, and the simple inscription affords abundant scope for meditation. The locality of the tomb is in a retired part of the grounds, and the grave until recently could only be visited with difficulty; but in the year 1858 a portion of the brick wall was removed, and an iron railing substituted, at this point, so that the historic grave of Franklin’s might easily be seen from the street. On September 1st, 1730, Ben Franklin married Deborah Read, in whose father’s house he had boarded when he first came to Philly. All authorities unite in concluding that the marriage was without ceremony and was what is known as a common-law marriage. Franklin is said to have had two legitimate and two illegitimate children, but as he and his wife spoke of all of them as “Our Children,” Charles Henry Hart (infra) has concluded that Dr. and Mrs. Franklin were the natural parents of the children referred to as illegitimate ones, of whom William Franklin, the Loyalist Governor of New Jersey, was one. The son born after his marriage was Francis Folger Franklin, who died of smallpox at the age of four, and his youngest daughter, Sarah, married Richard Bache. Ben Franklin died on April 17, 1790, of an attack of pneumonia, said to have been brought on by his insistence of exposing his body to the “fresh air.” His funeral was attended by twenty thousand people who followed his coffin to Christ Church Burial Ground. The plain appearance of the tomb must strike everyone as unworthy of the memory of Franklin, over whose remains one would naturally look for an imposing monument commemorative of his worth; but the stone as seen here is such as was contemplated by him before his death, and particularly ordered in his will. William Penn gave this land to the Quakers (also known as the Religious Society of Friends) for use as a burial ground in 1701. The Arch Street Meeting House was erected in 1804 on top of the burial ground. Penn, one of the most important figures in early American history, was a Quaker himself, though this particular building was constructed well after his death in 1718. To a lesser degree, the Arch Street Meeting House also celebrates Philadelphia Quakers’ involvement throughout American history in efforts to promote peace and the equality of all men and women. A cutout of Lucretia Mott, for instance, stands beside the entrance desk. Mott was a local Quaker involved in the abolitionist movement, the movement for women’s rights, and antiwar activities during the nineteenth century. The building is so large because, in addition to hosting weekly worship, regional congregations gathered here once a year for a business meeting. Originally, it had two separate but identical meeting rooms, one for women and one for men. Quakers believe in the equality of all people, so this division of men and women was not meant to suggest inequality of the sexes. Instead, they were afraid that women would not speak up in the presence of men, and thought having two rooms for business meetings would make the women more comfortable. By the standards of 1804, each room could seat a thousand people. In 1954, the men’s room, in the east wing of the building, was converted into a space for dining and exhibitions. The west wing, or women’s meeting room, still looks much as it did in the nineteenth century and is still used for the yearly business meetings. In keeping with Quaker aesthetics, it is furnished simply with benches and few decorative flourishes, though large windows let in a good amount of light. Some sort of fence around the site has been present since 1701, and the current fence was begun in 1795. Quakers don’t mark their graves, so the fence originally made it clear where the burial ground was actually located. Why is this a famous place? As the Arch Street Meeting House presents itself, a large portion of its fame stems from its association with William Penn. At the front desk, two out of five available brochures discuss Penn, and a third talks about the importance of freedom of religion in Pennsylvania, the colony that Penn established. Furthermore, half of the exhibition space in the east wing is dedicated to dioramas depicting important events in his life, and a series of plaques quote his writings. It was important to Penn that the laws of his new colony protect residents’ freedom to worship as they pleased, a rare privilege at the time and one that Quakers had not enjoyed in England. Later, aspects of Penn’s Pennsylvania Charter of Privileges would inspire the U.S. Constitution, especially the Bill of Rights. How does it draw attention to itself? One special thing about the Arch Street Meeting House is that it has been continuously used for Quaker meetings since its construction in 1804. For this reason, the building carries a degree of historical authority that many other sites cannot match. However, it also means that the Meeting House can't sell itself as a straightforward tourist attraction and must keep its religious function in mind in its self-presentation. To prepare for this presentation, I visited the site with my fellow classmate Kendra. Beforehand, we visited the the Betsy Ross House, the historic place that was the subject of her report. The Betsy Ross House served as an interesting foil for the Arch Street Meeting House. From the street, one notices that both have Pennsylvania historical markers outside, though the Meeting House is lacking the city’s more noticeable red, white, and blue marker and instead uses signage of its own creation in subtle colors and fonts that are in keeping with Quakers’ simple aesthetic. All the gates in the brick fence are kept open and are marked with signs; otherwise, I imagine the site might seem unapproachable thanks to its high walls and low-key appearance without banners or other advertisements. Generally speaking, the Meeting House takes a more passive approach to attracting tourists than the Betsy Ross House, as is apparent in its admission fee structure, gift shop, and self-promotion. The Meeting House suggests a $2 donation on its website, but no one mentioned the donation once in the building. Since its primary function is still religious, the Meeting House also does not have corporate sponsors, unlike the Betsy Ross House. As for souvenirs, the Meeting House does sell a few publications and trinkets related to Quakerism, but the for-sale section mostly seems like an afterthought. The Betsy Ross House, meanwhile, has a top-notch gift shop that is nearly as large as the first floor of the house itself, which again suggests the importance of visitors and the income they generate to the functioning of that site. The Meeting House, as a still-operational religious institution, would presumably exist whether it was visited by tourists or not. 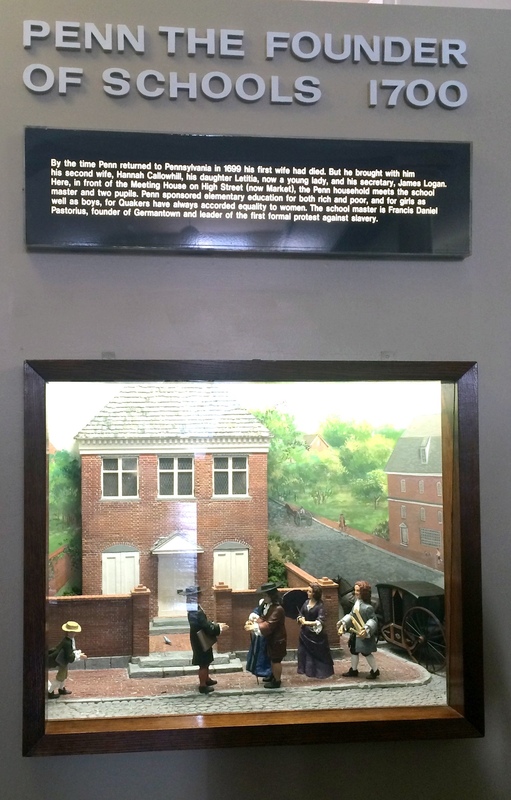 Perhaps because its sole function isn’t catering to visitors, some of the displays, like the dioramas of Penn’s life, seem slightly out of date in our digital world. In thinking about this particular place as a historical site, I also wanted to know more about the Meeting House and a bit less about Penn. For many visitors, Penn is the quintessential Quaker, and--in this most quintessential of Quaker places--the information provided responds to the public’s interest in him. However, Penn died almost a century before this building was even constructed. To me, in thinking about the Meeting House as a historical site, the most relevant displays were those about its construction and how ordinary Quakers who attended meetings here lived and thought. As might be expected, in sources of information for sightseers, like the official visitphilly.com website, the Arch Street Quaker Meeting House and other religious buildings that are still in use don’t seem to pay to promote their listings. However, they still appear on most free maps and pamphlets like “Beyond the Bell,” which is published by Philadelphia’s Historic Neighborhood Consortium. There is also a special series of signs erected by the “Old Philadelphia Congregations,” a group of churches and synagogues, to draw attention to this and other still-functioning sacred spaces. To return to the interior of the Meeting House, when one first enters, one is greeted by a tour guide by the front desk. The website states that if you call ahead to arrange a tour, your guide can focus on various topics of your choosing. However, if you just show up—especially on a quiet weekday, as Kendra and I did—the tour is casual. Even though it was just the two of us, we were shown around immediately rather than forced to wait until a larger group formed. In the final room we visited, the east meeting room, we sat across from our guide at a table and she let us ask anything we liked, answering many questions about the worship services based on her own personal experience as a Quaker. I found the unscripted, dialogue-like quality of the tour surprising—I hadn’t expected to hear so many anecdotes drawn from our guide’s own experience of Quaker religious life, nor to speak so much myself. The tour and other aspects of the Arch Street Meeting House’s presentation reflect the balance the institution tries to strike between being a tourist destination that aims to impart historical knowledge and a still-active religious institution that hopes to leave visitors with a positive impression of Quakerism. Welcome to the Betsy Ross House, the museum that celebrates the legendary maker of the first American Flag! Supposedly, rooms in this colonial house, built in the 1740s, were rented by Betsy Ross between 1776 and 1779. Betsy, a trained upholsterer, ran a shop somewhere along this block of Arch Street, but it is unclear in which house she rented rooms. When I asked about this seemingly crucial discrepancy, the man working the front desk admitted that this house may not be the house, but it is styled as such and documents Betsy’s courageous efforts—does it really matter if this was the place where she lived and worked? Although I am unconcerned that the so-called "Betsy Ross House" may have never housed Betsy Ross, I have a feeling that tourists might find this upsetting. Apparently the Betsy Ross House curators agree because not a single text panel mentions any doubts about the house or its heroine. Upholsterers did take in extra work making tents, uniforms, and flags for soldiers—and Betsy was paid a large sum of money from the Pennsylvania State Navy Board for making flags in 1777, but most scholars do not believe Betsy’s story. On their website, the Betsy Ross House briefly acknowledges this skepticism, writing: “So, historical fact or well-loved legend, the story of Betsy Ross is as American as apple pie. After your visit, decide what YOU believe!” Regardless of its historical accuracy, the Betsy Ross House tells the story of Betsy’s patriotism with concise text panels, a real-life Betsy Ross, the only interpretation of an 18th century upholstery shop in the country, and several interactive experiences for guests. There’s a kid’s scavenger hunt and play kitchen. There are audio guides for all ages. And there is even a hot-chocolate scent machine in the recreated kitchen—after all, patriots didn’t drink British-taxed tea, they either drank hot chocolate or coffee! By 1876, this building was generally recognized as the place where Betsy Ross lived when she made the first American Flag. During the 19th century, the Munds, a German immigrant family, ran several businesses from the house. They took advantage of the house’s interesting history by posting a sign on the outside that read: “First Flag of the US Made in this House.” By the end of the 19th century, most of the other colonial houses on Arch Street had been replaced with industrial buildings. Many people feared that the Betsy Ross House would meet the same fate. In 1898, a group of concerned citizens established the American Flag House and Betsy Ross Memorial Association to raise money to purchase the house from the Munds, restore it, and open it as a public museum in honor of Betsy Ross and our first flag. Elfreth’s Alley is purportedly the oldest continuously inhabited residential city block in the United States. Its thirty-two houses date from the 1720s to the 1830s. It has been described as the best preserved colonial street in Philadelphia, both in architecture and scale. Elfreth’s Alley is considered to be the closest approximation of a seventeenth century Philadelphia streetscape. The alley was established around 1702 by two blacksmiths, John Gilbert and Author Wells, presumably to give their smitheries, located along the Delaware River, easier access to 2nd street, a primary trade route for goods throughout the region. Though the alley was known by several different names during the first half of the eighteenth century, by the 1750s it was generally referred to as Elfreth’s Alley. This name comes from the prosperous blacksmith Jeremiah Elfreth, who acquired land on both sides of the alley, near 2nd street, from two of his five wives, both of whom were related to John Gilbert. Most early inhabitants were craftsmen who rented their homes, usually only for a few years before moving on to other residences. Some examples of early inhabitants include William Maugridge, a friend of Benjamin Franklin, who lived in number 122 in 1728. Matthias Meyer, a German potter from Hilsbach, purchased number 199 in the year 1757. Moses Mordechai, a founding member of the synagogue Mikveh Israel, was a tenant in number 118 in the year 1769. Today, the Elfreth’s Alley Association Museum occupies numbers 126 and 124. Number 126 was built and sold by Jeremiah Elfreth to Mary Smith and Sarah Milton, two highly regarded mantua makers (dress makers), sometime in the 1760s. The Elfreth’s Alley Association was founded in 1934 to preserve the historical character of the block. Also during the 1930s, residents of the Alley began opening their homes to the public one Saturday in June, a celebration known as “Fete day.” In 1948, a publication by the American Association for State and Local History reports that the EAA was collecting money to aid in preservation efforts. The language of the statement implies that the EAA was not yet receiving any public support. Their efforts succeeded and in 1960 the alley became a National Historic Landmark. Today the block is touted in tours of Old City and is counted among Philadelphia’s famous historic landmarks. It even makes an appearance in the popular children’s book Good Night Philadelphia. The City Tavern is one of the most genteel and traditional taverns in Philadelphia. It was constructed by the subscription of fifty-five eminent Philadelphians in 1772. They agreed that their city needed “a large and commodious tavern,” which was suitable for the largest and most cosmopolitan city in British North America. The construction finished in 1773, and the tavern was completed with the latest Federal architecture style of the time. The building consists of five stories including the cellar floor and the attic. We will concentrate our tour to the first and second floors since they were the main areas where feasts and meetings were usually held. On the first floor, you can see the subscription room where people could read magazines and newspapers that the tavern subscribed to. With no television or Internet, this tavern worked as an informational hub where people gathered to read and share the latest breaking news. Across the subscription room, there are two coffee rooms, where merchants drank coffee or alcohol while discussing ship movements and business. Back then, coffee was heavily taxed and considered a luxury. Therefore, only three ounces of coffee were allowed per person per day. And it was only served to men, not to women. Ship captains came to this room and auctioned off their merchandise. Since they needed geographical and additional materials during their discussion, the tavern provided maps on the wall for their accommodation. Nowadays, these maps work not only as historical and informational documents but also as beautiful wall ornaments. On the second floor, you can see the Long room right in front of the stairs, so named for it’s shape. It is where music performances, large meetings, and card games were conducted, and in the eighteenth century, it was decorated with elegant balls so was called the ball room. It was the second largest ballroom in America. In 1777, Congress held the first Fourth of July celebration in this room, and Continental congress often held meetings here. Moreover, George Washington had his inaugural party in this room. Besides the Long room, there are two dining rooms that were used as private meeting places for clubs or groups. Each dining room has a specific name derived from its benefactors. For example, this room is called the Cincinnati room to commemorate the Society of Cincinnati that helped to refurnish this room. It is also known as George Washington’s favorite room because it only had one entrance and exit at the time, so he could come into the room and talk about politics without being overheard. Across the hallway, there is another dining room called Charter room. It was named to commemorate 53 original subscribers of the Tavern and often reserved for their private meetings. The third floor contained lodging-rooms, and the attic was the servants’ quarters. The tavern’s cellar floor is also an interesting place. It was not only the kitchen, but was also a storage area where all the ingredients in the casks, barrels, and boxes were piled up. Therefore, the cellar area provides us with a traditional manual of storing foods around the time. Unfortunately, these rooms and their objects are not the originals from 1777. The original tavern was partially destroyed by a fire in 1832 and completely demolished later. The National Park Service rebuilt the current building in 1976 after painstaking research to accurately replicate the original building. Accordingly, the restored building is exactly the same with the exception of some modern conveniences. Since we have looked through the brief history and structure of the Tavern so far, now let me reveal the historical, social, and cultural importance of the Tavern. Historically, this place was an important backdrop in the vibrant past of early America. Numbers of significant figures in American history, including George Washington, General Lafayette, Thomas Jefferson, Benjamin Franklin, and John Adams enjoyed “a feast of reason and a flow of soul” at the Tavern. Adams and Washington met each other for the first time and often discussed political issues here. Because politically central figures often gathered here, the latest political news was first gathered and spread from here. For example, when Paul Revere rode six days from Boston to deliver the news that the British had closed the port in retaliation for the tea party, the City Tavern was the first place that he visited. Thus, the records of the tavern’s customers and events are historical documents to that track down early American history. Socially, the tavern functioned as part of the city’s basic infrastructure. It was not only a restaurant but also operated as a hotel for out-of-town visitors. Since the harbor was just across the street, ship captains who arrived from all over the world auctioned off merchandise, advertised business, and organized new companies at the tavern. Therefore, it functioned as a bank, convention center, and stock exchange at the time. Lastly, the City Tavern was also the city’s center for entertainment. Dance performances, musical concerts, and games were conducted and attracted more and more people to the tavern. Culturally, the City Tavern was the capital of eighteenth-century culinary art. From the nearby port, a mixture of ethnic groups came into Philadelphia with their own culinary traditions. For example, the British brought meat pies, scones, and bread, while the Germans brought traditional sausages and soups. Curries, hot peppers, exotic spices and fruits were adopted from African and West Indian slaves, and French chefs, food artisans, and tradesmen improved Philadelphia’s cuisine up to European standards. Therefore, the City Tavern is not just a restaurant, but a historical, social, and cultural city center of the eighteenth century. Now let’s look at how the tavern utilizes its history and food culture in its contemporary adaptation. When restaurateur and chef Walter Staib took over the Tavern in 1994, he maintained his management philosophy as a transmission of the historical atmosphere and traditional recipes of the tavern. After years of research and effort, Staib succeeded to interpret the original eighteenth century recipes to modern measurement, which he adopted to improve the tavern’s menu. The City Tavern’s staff wears eighteenth- century costumes to preserve the traditional and authentic atmosphere. Meanwhile, bands play old music, and bartenders provide traditional cocktail recipes, and thus, customers are able to enjoy the genuine food and entertainment culture of the eighteenth century. In order to promote its cuisine, history, and atmosphere, the City Tavern runs its own website and actively adopts Social Network Services. From the website, one can easily obtain basic information, including the history, menus, and contact information. On its Facebook page, images of food and information of upcoming events at the tavern are uploaded in real time. The twitter page is operated by Chef Walter Staib himself, therefore his food recipes and broadcasting schedule is provided. Lastly, there are more than 100 video clips about the City Tavern uploaded on Youtube. The City Tavern preserves its history, adopts its old culture in contemporary methods, and communicates with customers through modern mass media. Thus, the Tavern is not a stagnant and stuffed place in a history, but it survives as a place of experience, and can be continuously enjoyed among contemporaries. Above all, these sites together effectively present Philadelphia as a historically significant place, despite the fact that their importance has waxed and waned with the vicissitude of history. Philadelphia, which was the capital of the United States until the 1800s, has been injected with new energy and historical meanings through people’s constant engagement with the city.